Hip Hop Dance Master Class with Ana "Rokafella" Garcia at NJPAC! Ana "Rokafella" Garcia is a NYC native who has represented Hip-hop dance professionally over the past two decades. She co founded Full Circle Prod Inc- NYC's only non profit Break Dance Theater company with her husband veteran Bboy Kwikstep. Together they have generated theater pieces, poetry, a documentary highlighting the Bgirl lifestyle entitled "All The Ladies Say" and original music based on her experiences growing up in Hip-hop's Mecca. She is hired internationally to judge and host Break dance competitions based on her mastery of the classic Hip-hop dance style and she teaches unique workshops aimed at evolving and preserving its technique and social aspects. 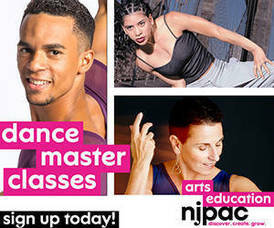 The NYC public / private schools, national universities as well as prestigious dance studios and community centers present her workshops to aspiring dancers as part of their dance based career development programs. Presently she is an artist in residence at the American Tap Dance Foundation, an adjunct professor at The New School and received a National Dance Teacher Award from the American Dance Festival. She has been featured in pivotal Rap music videos, tours, film and commercials as well as choreographed for diverse festival concerts such as the Oregon Shakespeare Festival and to curate a street dance program with Times Square Arts & DanSpace Project. In the Spring of 2017 she launched ShiRoka--a T shirt line collaboration with Shiro, a female Japanese Grafitti writer, to add to her Earring Designs collection which can be found at the Bronx Museum gift shop and online. Rokafella is a multi faceted female Hip-hop artist who references street and Latino culture as her foundation.